305 x 225 mm. Parchment. Double column; each column 200 x 67 mm. ; 40 lines to a column; ruled. One 2-line blue initial F with red penwork; several simple blue and red 1-line initials. Recto: Bk. I, ch. 3, 163ich. 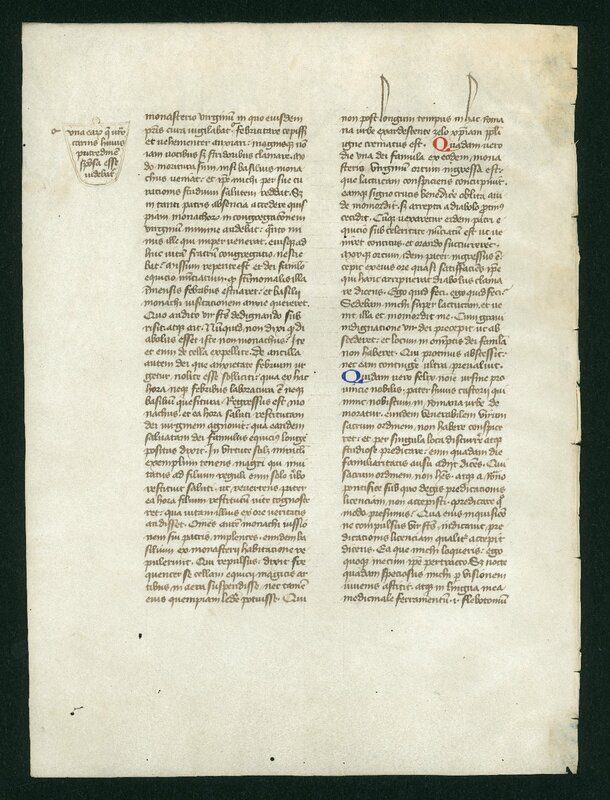 4, 165c; verso: Bk. I, ch. 4, 165c168d. Provenance: Originally ff. 274 (see Census, U, 1945, no. 56); purchased by Ege from Thorpe (Guildford), c. 1925 and broken up: (i) thirty-three leaves, Sotheby's, 26 November 1985, lot 70; (ii) one leaf, Maggs, Bulletin 11 (1982), no. 88; (iii) one leaf, Maggs, Bulletin 21 (1997), no. 66; (iv) one leaf, collection of Dr. Christopher de Hamel, Lon¬don; (v) one leaf, Maggs, Illuminations, Catalogue 1319 (2001), no. Ill; (vi) other leaves in Original Leaves from Medieval Manuscripts offered for sale by the Staff Loan Fund Association, Lima Public Library (Lima, Ohio). Transmission or reproduction of materials protected by copyright beyond that allowed by fair use requires the written permission of the copyright owners. In addition, the reproduction of some materials may be restricted by terms of gift or purchase agreements, donor restrictions, privacy and publicity rights, licensing and trademarks. Works not in the public domain cannot be used commercially without permission of the copyright owner. Responsibility for any use rests exclusively with the user.